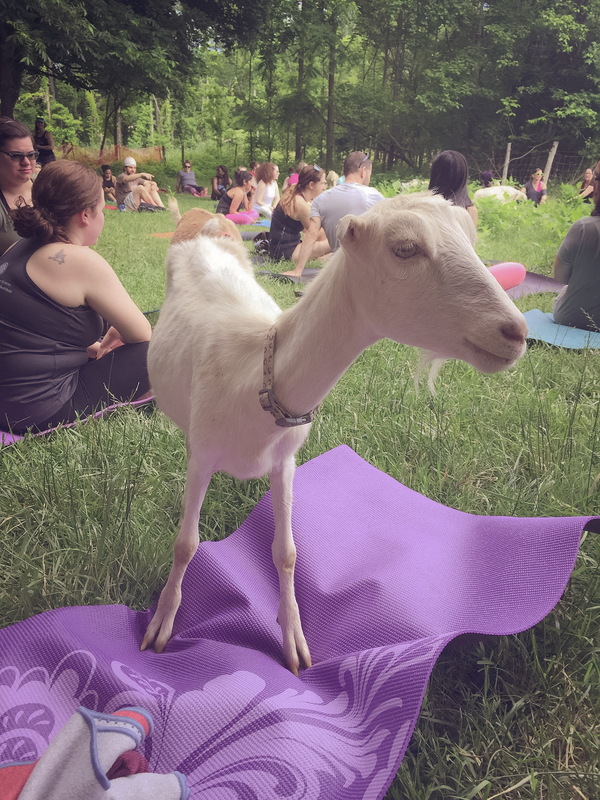 Are you eager to sign up for 2019 Goat Yoga, or know someone who is? We are excited to offer our fourth season of goat yoga at Dover Vineyards in Concord, NC. Wine tastings will be available for those who want to stick around after each class! Have YOU had a chance to do mountain pose next to a goat? Join our social goats in the pasture and bring new meaning to your practice… they love yoga on the farm as much as we do. There is nothing better than goat noses interrupting yoga poses. All goat yoga is laid back, beginner and family friendly. We offer a traditional yoga Slow Flow class to enjoy the outdoors and share the space with animals. Get in some good stretches, take in the fresh air, and snuggle our adorable baby goats! Our 2019 schedule begins Sunday May 12th on Mother’s Day and repeats monthly on second Sundays through October 2019. Classes will be held at 5:30pm. Space is limited to maximize engagement with our social goats. Additional time slots may be available as classes fill. Sale of Flex Passes has closed. Pre-purchase tickets for the Sunday of your choice. We look forward to having you join us! As a courtesy to our host, our goats and our yogis, we request that you pre-register. Children are welcome! Children over age 12 require individual registration. All children must accompany a registered adult. * WATER will be provided. •Please bring your own yoga mat. We will share blankets if they are available, but we don’t have enough for everyone! We will have some mats available for sale while supplies last! •Event is Rain or Shine… covered outdoor area is available, class will go on! *We encourage those who can, to carpool. Plenty of parking, the environment thanks you. *Please DRIVE SLOWLY and be MINDFUL of cats! **We do not offer refunds. Unused classes do not roll over into the next season, are non-exchangeable and non-transferable. Please contact us with any questions. We are often able to accommodate private groups. Inquire by email.